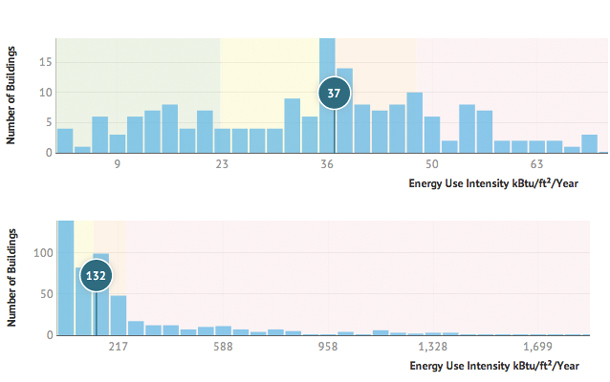 Screenshots from the Buildings Energy Database for Illinois. The state has only contributed information on about 700 buildings so far. Of those, electricity consumption, top, is roughly average — the blue circle is a national average for similar buildings — but total energy consumption, bottom, fares better. Critical though they may be to making important decisions in the age of big data, computer models come with one huge caveat: They aren’t real. So the Department of Energy’s new Buildings Performance Database, which contains actual data on tens of thousands of existing buildings across the country, could sweeten the pot for those looking to invest in energy efficiency. The 65,000 buildings in the data set so far are residential and commercial, public and private, and have been made anonymous. It’s the largest free, publicly available set of information like this currently available. And DOE is inviting building owners to help it grow by submitting new data. As of this writing, Chicago’s 606- area codes were without data. New features will come in time, but the most recent addition includes a retrofit analysis tool, which compares the likely energy savings of different retrofits. Nearly 40 percent of U.S. energy consumption in 2012 was by residential and commercial buildings. Even though it’s an idea seemingly as old as building itself, energy efficiency has only recently grabbed the attention of big financial players, for just the reason that the DOE’s new tool is exciting: it adds some certainty to the assumption that saving energy is a worthy bet. As data pours in, it becomes more clear to investors and governments that efficiency is often a winning bet for single-family homes, large government facilities and other building types. That flood of data creates business opportunities, too. 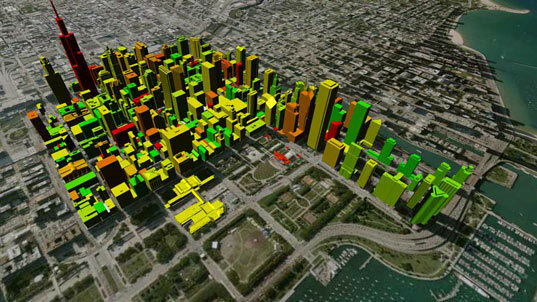 A few years ago, Chicago architects Adrian Smith + Gordon Gill (AS+GG) developed the Chicago Central Area DeCarbonization Plan to assess variables like the age, use, condition, and energy consumption of 500 buildings in and around the Loop. The ambitious plan calls for a retrofit of half the city’s commercial and residential buildings, resulting in a 30 percent reduction in energy use by 2020. Whether or not the city achieves that goal (it is tied to the Chicago Climate Action Plan), projects like the DeCarbonization Plan are important because of their perspective. Though engineers may beg to differ, it can be maddening to consider the complexity of energy systems embedded within buildings (themselves a network of systems), embedded within city systems, and so on. But that’s where opportunities for transformative change exist. And since all this deals with improving the efficiency of our urban support systems, it could ultimately save money and improve quality of life. If you are interested in contributing a dataset to the database or have other recommended sources, please contact buildingsperformanceDatabase@ee.doe.gov. Files can be sent in any electronic format and should be marked "PROPRIETARY." Listen to architect Gordon Gill discuss his firm&apos;s systems and strategies for reducing energy consumption here.